This ancient, beautiful complex consists of a villa from the 16th Century and several outbuildings. Very nice hilltop location in the immediate vicinity of Florence, accessible in 15 minutes. This ancient, beautiful complex consists of a villa from the 16th Century and several outbuildings. Very nice hilltop location in the immediate vicinity of Florence, accessible in 15 minutes. The 2 apartments are located in the buildings on one side of the villa and share a large garden and a bean-shaped pool. Maid service on request to be paid on site. Internet with Internet stick in the price. ITF470 has a private outdoor area for al fresco dining. 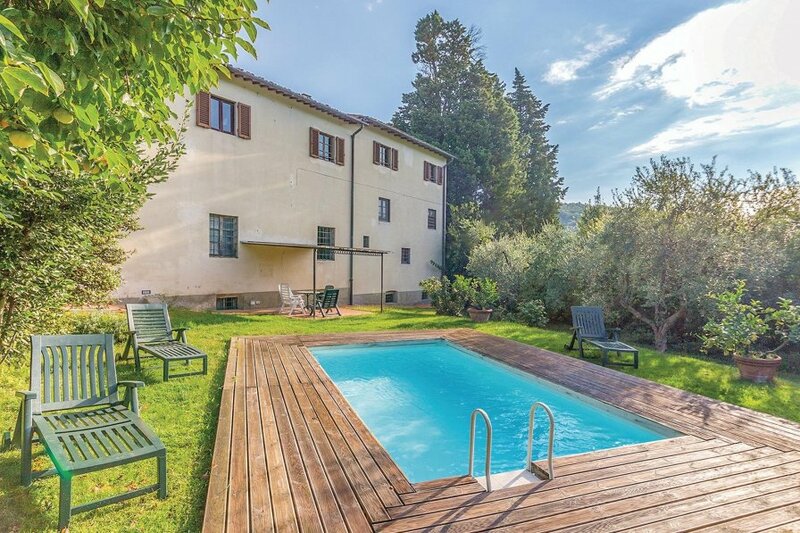 Distances: 500m grocery store and restaurant, tennis courts and public swimming pool 5 km, Bagno a Ripoli (shops), 6 km, Florence 10 km, airport 18 km. This apartment is made from brick or stone and was originally built in 1500 and refurbished in 2002. The agent has rated it as a three star property so it is a well-kept apartment, equipped with standard furniture. It is also good value for money. This apartment has use of a shared pool and is located in Villamagna (Bagno a Ripoli), only 6km from Bagno a Ripoli. It is set in a good location: there is a restaurant only 500 metres away. The apartment has wireless internet available for an extra charge. You can also park on-site at no extra charge. The apartment is well equipped: it has a refrigerator, washing machine and dishwasher. It also has a shared barbecue.